When I wrote my first book, I knew nothing, Jon Snow. I wrote by ear, from a lifetime of reading. I’d had one creative writing class, but I think it was a love of words, turn of a phrase and beautiful, unusual description that influenced my initial writing. I wanted, and knew I needed, instruction. I am an information junkie. I want to learn, which serves me well when I write historical fiction. I love the research. I discovered Writer’s Digest and The Writer magazines. Every month I learned exactly what I needed at that moment in my manuscript. Living in Lost Angeles at the time, I took extension classes through UCLA. I’ve devoured books on writing. I read Anne Lamott’s, Annie Dillard’s, and Ray Bradbury’s books on writing. I bought a lot of how-to books through Writer’s Digest. (this was before Amazon and the cornucopia of writing books available there). I’ve been writing for awhile now and I learn with every new effort. I still read how-to books. I still feel I need instruction. I suppose I’m looking for that magic pill in print, that one suggestion that will resonate so strongly that I will finally write the story that no agent could reject. In the meantime, here are some of my most recent finds. I hope they can help you as well. Hooked by Les Edgerton and The First 50 Pages by Jeff Gerke will help you with those important openings. For overall storytelling there’s Story Physics and Story Engineering, both by Larry Brooks. One of my new favorites is Writing Young Adult Fiction for Dummies by Deborah Halverson. For more specific information I go to Make A Scene by Jordan E. Rosenfeld, Word Painting; A Guide to Writing More Descriptively by Rebecca McClanahan, and Show Don’t Tell by Robyn Opie Parnell. Some of my favorites this year have been Writing Active Setting by Mary Buckham, The Negative Trait Thesaurus and The Positive Trait Thesaurus by Anglea Ackerman and Becca Puglisi, and my final recommendation is Strong Verbs Strong Voice by Ann Everett. 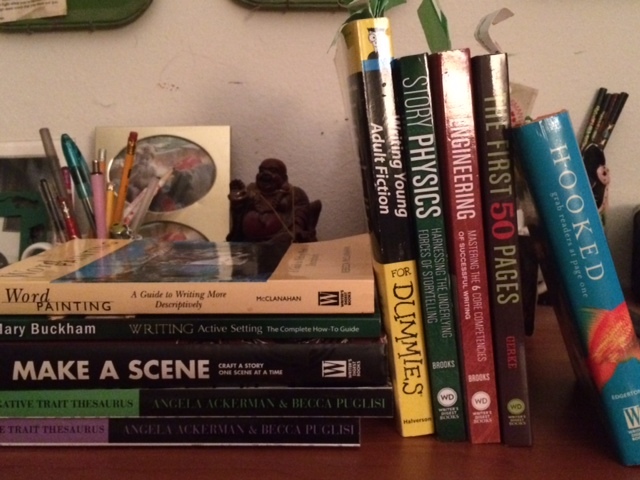 Writing to get published is not an easy road to choose and I think we all need help. Whatever can make our writing stronger, clearer, and smarter should not be ignored. It’s about learning the craft, the rules, and getting an education. I know I need all the help I can get and I’m not ashamed to admit it. I want my writing to shine and I’m willing to do the homework. Are you? Do you have books you’d recommend? Could you stuff some strong verbs into my head next time you see me? I wouldn’t presume to give advice to you, my friend! But I always loved the methodology in screenwriting as a guide to good story development, and definitely anything by Joseph Campbell for human connections. 🙂 And Ray Bradbury’s Zen book. The longer I writer, the more I see how little I really know. It can be a very humbling journey. I love your attitude about learning the craft. I met a guy recently who decided to try his hand at writing, but he wasn’t a reader and didn’t know anything about writing. After his story had been critiqued, he was very upset at himself for not being able to get it perfect in the first draft. He hasn’t been back to the writing group since.